Leslie D. Hershfield | Schulman, Hershfield & Gilden, P.A. Les Hershfield, a partner at Schulman, Hershfield & Gilden, P.A., maintains a diverse and growing litigation and business law practice focusing on a broad spectrum of legal issues, including cases dealing with wrongful death, survivorship and personal injuries, breach of contract and business torts, real estate law and other complex civil litigation. He regularly counsels individuals and regional and national businesses concerning these legal issues, appears frequently in state and federal courts across Maryland jurisdictions, and is well respected for his ability to aggressively resolve, and if necessary, litigate legal disputes in a cost-efficient manner for his clients. In the last few years, Mr. Hershfield has litigated a variety of challenging legal issues, including representing employees involved in various disputes concerning noncompetition clauses and trade secrets claims, representing an individual alleged to have participated in a multi-million dollar real estate conspiracy and fraud, and negotiating significant settlements in several wrongful death and serious personal injury cases. He has tried numerous jury and non-jury cases to verdict in state and federal courts, and has extensive experience in trying cases before arbitration tribunals such as JAMS. Mr. Hershfield recently won a verdict in excess of $3 Million Dollars in the Circuit Court for Baltimore City (Baeuerle v. Mayor and City Council of Baltimore and Adams, et al.) and has successfully settled several multi-million dollar claims. 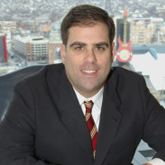 Additionally, Mr. Hershfield is AV rated by Martindale Hubbell and was named a Maryland “Super-Lawyer” in the category of business litigation in January 2007 by Maryland Super Lawyer Magazine.